Life is Great at Super 8 Eagle River. Located at the intersections of Hwys. 45 and 70, places us close to downtown. Within walking distance of shopping and dining as well as the fairgrounds which hosts numerous Arts and Crafts Shows as well as Festivals throughout the Spring, Summer, and Fall months. We offer off-site boat docking on the Chain of 28 Lakes. During the winter months you can snowmobile right from the door with access to over 500 miles of groomed trails. 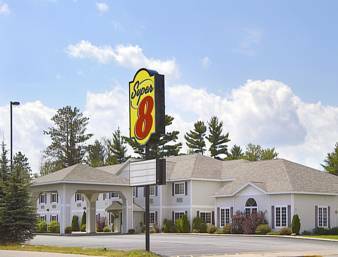 We feature free Wi-Fi, in-room coffee, indoor heated pool, hot tub, game room and free Super Start breakfast with waffles and fresh fruit. Limited rooms set aside for pet owners. Contact property for availability. ~21 miles from Eagle River. ~68 miles from Eagle River. A large statue of a model skier, circa 1960, stands at the entrance to a ski resort. ~56 miles from Eagle River. A smiley face makes the water happy and smiles down on this westernmost Yooper town.